Cancellation/change of reservation can be made up until 6.00 p.m. on the day BEFORE arrival. If a cancellation is made later, we charge for the first night. Payment can be made by cash or credit card (Visa and MasterCard). Other payment options only after prior agreement. Wifi - wireless broadband is provided free of charge in all our guest rooms. Dogs and cats are welcome in one of our rooms. Please tell us you will be bringing animals with you at the time of booking. Cost: 100 SEK per animal per night. Cot available – please request when you book. 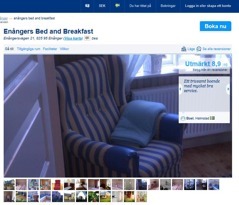 Cost: 200 SEK per night.